Today’s metal roofing has come a long way since the corrugated roofs seen in the early 1940s and 1950s. Metal roofs are no longer reserved for sheds and barns. They are becoming more popular as roofs for residences, particularly in areas of inclement weather. 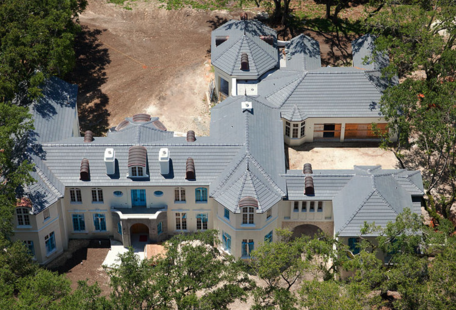 Metal roofs are even designed to fit a wide range of architectural styles, such as Victorians and Spanish Colonials. Metal roofs feature adhesive and hardware attachments, as well as hidden fasteners and interlocking panels, giving them a clean look. 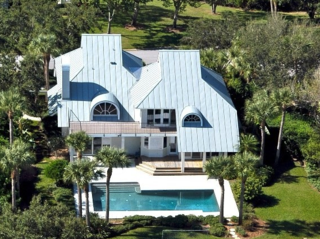 Metal roofing is now the standard in some areas, including the Florida Keys. Metal roofs are preferred over traditional asphalt roofs because of their durability. Some have guarantees of 40 or even 50 years. They can withstand even the strongest winds and rain from a hurricane. They are often used in areas with heavy snow as well. While metal roofs are a costly investment at first, they can last for decades. Once you buy a metal roof, you may never have to buy another roof for the rest of your life. Many homeowners like the ability to customize their roof color. While you can opt for a plain silver or gray metal roof, you can go with a color that best complements the rest of the home. You can opt for white, black, brown, or a color that stands out even more, such as red, blue or green. Most residential metal roofing is made of aluminum, steel or copper. It involves 24- or 26-gauge steel sheets that have a metallic coating to prevent rust. The next coating is a paint finish. Aluminum sheets are painted, but don’t require a metallic coating. Copper does not corrode, so it does not require a coating. It may be used for special features of a roof. Metal roofing does not all look the same. It can be stamped into many shapes, depending on your preferences. Some look like tiles and shingles from a distance. You can even have a metal roof with stones embedded, but this gives off a less metallic look. Steel roofing products are coated with either zinc or galvalume, which is a combination of zinc and aluminum. Galvalume lasts longer than zinc alone. Coatings come several thicknesses. Of course, a thicker coating will be more durable, but it will also cost more. The Metal Roofing Association (MRA) recommends a galvanizing thickness level of AZ-50 or AZ-55 for galvalume coatings and a minimum of G-90 for residential applications. Aluminum-based panels work better for homes located near oceans. If a home is located in a very sunny area with high levels of UV light, premium certified paint coating is recommended. As a homeowner or business owner, this may all seem complicated. Fortunately, metal roofing contractors such as Metal Master Shop understand all the intricacies involved with designing and installing metal roofs. We carry a variety of roofing panels and accessories such as elbows, goosenecks, scuppers, all purpose vents, pipe boots, zipper boots, finials, flashing, roof edges, caulking and more. We offer special services such as exporting and custom orders. We can help you choose the right materials based on the location of your home or business. Our staff can also help you understand the costs involved and help you design a custom roof that fits your needs and preferences. 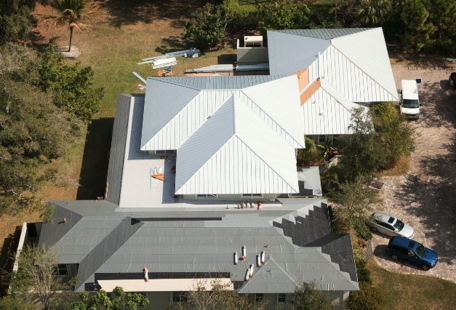 It may be hard to find the right Florida Keys metal roofing company, especially since metal roofs are still uncommon. Fortunately, we have some tips to help. First of all, you should choose someone with at least several years of experience installing metal roofs. Installing a metal roof is much different than installing a traditional roof, so you want someone who knows what they’re doing. If a roof is not installed properly, it can cause leaks in the home. It can also wear out quickly. If you know someone who has had a metal roof installed, ask them for recommendations. You can contact contractors and architects in the area to see if they have worked on homes and commercial projects utilizing metal roofs. You can also use a contractor site on the internet to help you find a metal roofing company in the Florida Keys. Don’t just choose the first metal roofing company you find. Schedule consultations with several of them so you can compare experience, pricing and customer service. Ask for the contact information of their customers so they can discuss their experiences with you. Ask about positives and negatives so you can make an informed choice. Metal Master Shop has the experience to help you with constructing a metal roof for your home or business in the Florida Keys. We are a premier metal roofing shop with many satisfied customers. Consider us for your metal roofing project. We guarantee you’ll be satisfied as well. Located in Miami, Florida, Metal Master Shop is your one-stop shop for everything related to metal roofing. From panels to accessories, we have everything you need to install a metal roof on your home or business. We offer various types of panels, including mechanical seam, snap lock, nail strip, 5V crimp and Zee Lock panels. We also offer accessories to ensure your metal roof has everything it needs so it can last for many years. We have elbows, goosenecks, pipe boots, zipper boots, various types of scuppers, all purpose vents and caulking ins tock. We also fabricate roof edging, flashing, coping caps, finials and all profiles of architectural metals. Can’t find a product you need on our website? No problem! We may not have it in stock or even carry it at all, but that doesn’t mean we can’t create it. There are options available to you. We can create a custom product to fit your needs. We specialize in custom orders and want you to be satisfied. Just give us a call and we can help. If you can draw it, we can make it. Do you need special panels? We can create the panels and even cut them at your job site—in any length you desire. Here’s another reason why you should consider us for your roofing needs: The staff at Metal Master Shop are experts at metal roofing. We have direct roofing experience and understand the unique challenges of installing metal roofing in South Florida. All panels and products we sell are in full compliance with the Miami-Dade County Building Code. We have also specifically designed our products so they are sturdy enough to withstand the weather conditions found in Florida. Feel safe knowing that the products we sell will last a long time. Are you a contractor who works internationally? If so, we can help you. We can ship our products to ship Mexico, Latin America and the Caribbean. We can ship 5V-crimp metal panels and standing seam metal roof panels in aluminum, copper, galvalume and rheinzink. We include all the metal roofing accessories you’ll need including underlayment, clips and screws. With our export services, you’ll have access to architectural support for drawings, take-off and precise measurements. Our technical support team can also help with installation issues and questions. Are you searching for assistance with your next metal roofing project in South Florida? Whether you’re a business owner or homeowner looking to upgrade your roof or a contractor working on a construction project, Metal Master Shop provides high quality metal roofing supplies in Pinecrest, FL. We are the best full-service roofing company in Florida and offer everything you need to install a high-quality roof that will last. Our staff has the knowledge and expertise to help you get started. For a free quote or to get more information about how we can help, give us a call at (305) 261-9290 or fill out our online form. Metal roofing has changed a lot in the past decade. It is incredibly strong and now works and looks better than ever. However, you will find critics. There are many people who have negative things to say about metal roofing. These are based on misinformation, however, and many of these are myths that are unfounded. One common myth is that metal roofing causes lightning strikes. It’s important to understand that while metal conducts electricity, it’s not a magnet that draws lightning to it. You may also hear that metal roofs are noisy. While some can be, others are constructed so they are quiet, even when it rains. Another common myth is that hail can damage a metal roof. Your typical hailstorm is not strong enough to harm a metal roof. However, if you experience hail the size of golf balls, then you might experience some denting. This is minimized with textured roofs. You may have also heard that you can’t walk on a metal roof. This is not completely true. There are ways to do so without causing damage. Contact the manufacturer to learn more. Metal Master Shop is a Florida Keys metal roofing company that can help you achieve your roofing goals, whether you’re a contractor, homeowner or business owner. We are proud to be South Florida’s only full-service roofing supply company. As such, we offer everything you need for your metal roofing job, from start to finish, including complete roofing kits and accessories. If we don’t have what you need, we can order it or even make it for you. We understand that transitioning to a metal roof is a big decision. It can also be costly, so you want a quality roof that will last for decades. We sell materials of the highest quality and durability. All products we sell are in compliance with the Miami-Dade County Building Code. As such, our roofs can withstand extreme weather conditions in Florida, such as hurricanes, heavy winds and rain storms. We not only sell quality equipment, but we have top-notch customer service to match. Our friendly staff members have backgrounds in roofing, so they have the knowledge and expertise to answer your questions so you get your roof on properly. Whether you’re a contractor or homeowner, we can help. We are conveniently located in Miami near Palmetto Expressway and the 836, just west of 72nd Avenue. Get started with a free quote. For more information, give us a call at (305) 547-9815 or fill out our online form. © 2018 Metal Master Shop. All Rights Reserved.